Chocolate is made from cocoa beans. Cocoa beans grow on rainforest trees called cocoa (or cacao) trees. 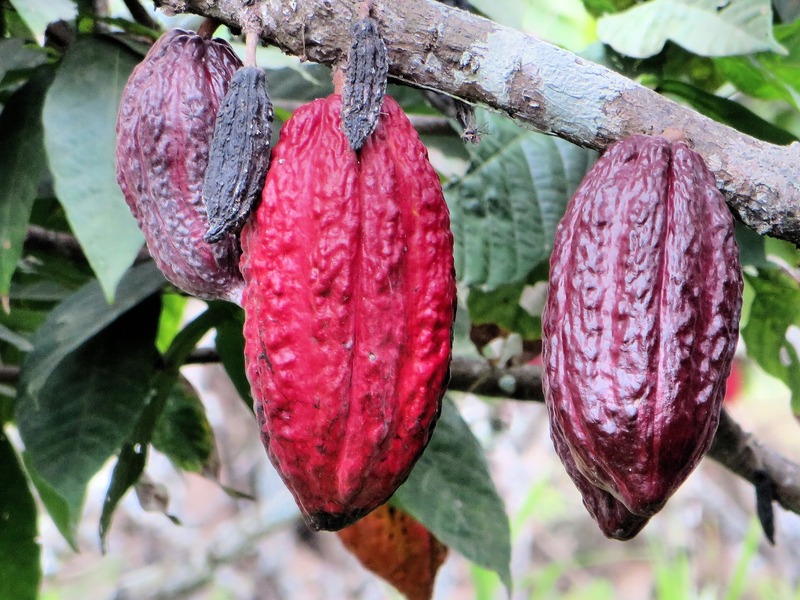 These trees produce hard, football-shaped pods, which hold about 40 cocoa beans each. When the pods are mature, workers harvest them, carefully slicing them from the trees using long poles tipped with sharp blades. Next, they open the pods with a machete and scoop out the beans. The beans and the sugary pulp material surrounding them are allowed to ferment for about 2-7 days. Fermentation prevents the beans from sprouting, removes the pulp, and, most importantly, starts creating the flavors we think of as chocolate. After fermentation, the beans are thoroughly dried, usually in the sun. 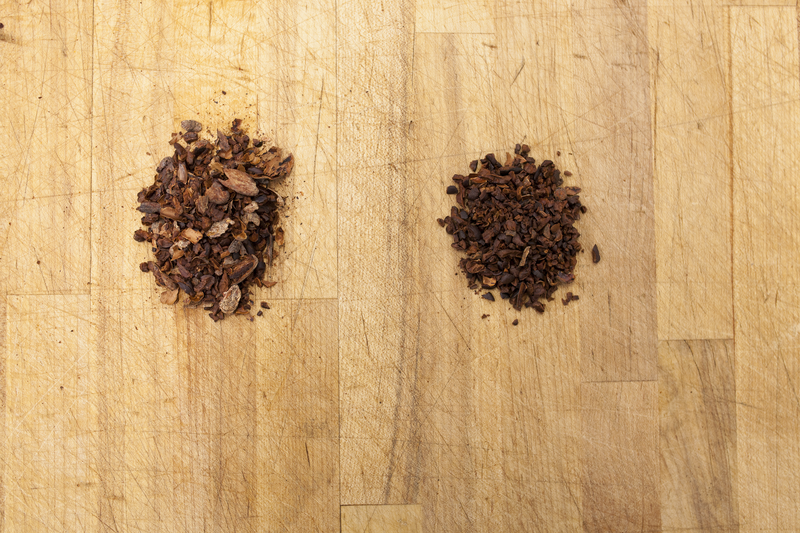 These steps make or break chocolate's quality. I pay premium prices for my cocoa beans because it takes money to do them well. And I boldly display origins on my products because the experts there performing these steps deserve top billing. When a shipment of cocoa beans reaches the factory, it is not perfect. Before any processing can begin, the beans must be sorted to remove sticks, stones, damaged beans, and other unwanted materials. After sorting, the beans are roasted. 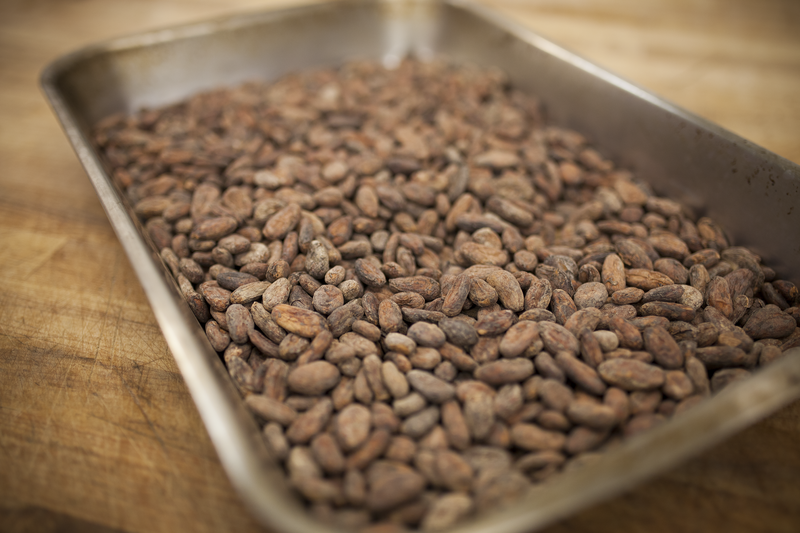 Roasting is essential for developing the chocolate's flavor, removing some of the acids produced during fermentation, and making the beans safe to eat. I use a different roasting profile for each bean origin to bring out the most interesting flavors. Once roasted and cooled, the beans are cracked in a mill. Cracking separates the unwanted husks from the beans. What you see on the left are cracked beans. 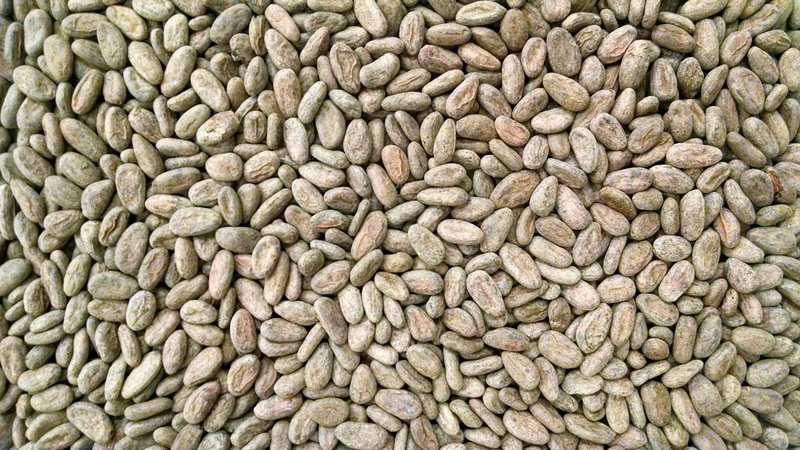 The mix of cracked husk and bean fragments is then winnowed, a process in which a gentle vacuum removes the lighter husk material from the heavier bean fragments, now known as nibs. What you see on the right are nibs. Next, the nibs enter a grinder. The grinder is quite simple: its granite wheels roll over a spinning granite base, pulverizing and warming the nibs until they liquify. After several hours, sugar is added to the grinder as well. 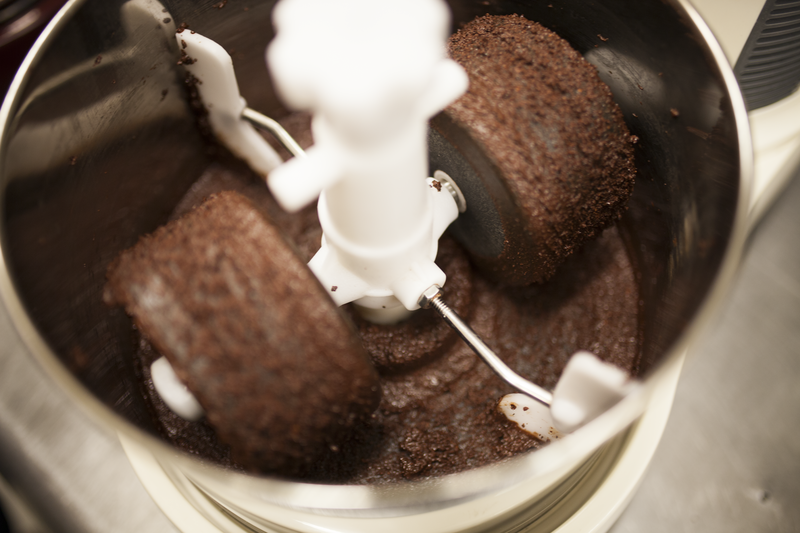 Grinding continues until the chocolate feels smooth to the tongue and has the flavors I am trying to develop, which can take several days. Once smooth, the liquid chocolate must be tempered before it can be molded into bars. 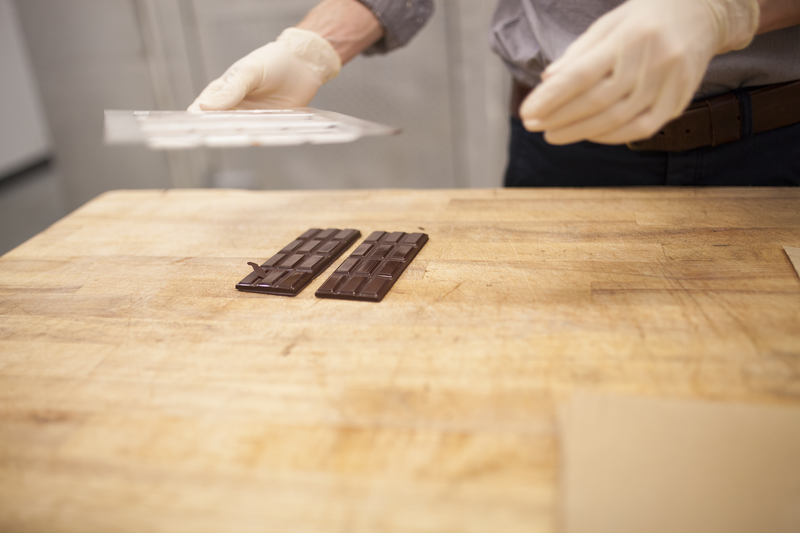 Tempering is a controlled cooling and heating process that gives chocolate the shine and snap we all love. Next, the tempered chocolate is poured into molds and briefly chilled. When they're ready, the bars easily pop out of their molds for packaging, eventually ending up in your hands for the most important step: eating.